The couple bought the stone-built period property in the historic North Northumberland market town of Berwick 10 years ago and turned it into an award-winning bed and breakfast business. Formerly a vicarage, the Victorian home is elegantly proportioned and stands in an elevated position overlooking a parish churchyard, with river views beyond. 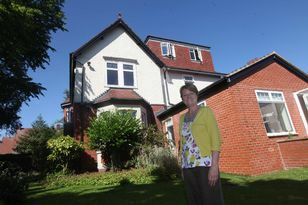 “It’s a beautiful house which was built around 1880, and we just fell in love it,” said grandmother-of-four Ruth. The versatile accommodation is set over three storeys and offers huge potential to easily house independent relatives by creating a self-contained annex on the second floor. To the ground floor there is an attractive stone portico entrance, which opens into a reception hallway from which there are three spacious reception rooms, a kitchen, pantry, boot room and double en suite bedroom. A further six bedrooms, five of which have en suite shower rooms, an additional separate shower room, toilet and linen store are to the first floor. The second floor is used as owner’s accommodation for Maurice and Ruth, where there are two double bedrooms, one with an en suite and a separate shower. “Because the house is so large we have our own self-contained area so we still feel like we have a home alongside running a guesthouse,” explained Ruth. “The rooms are all very spacious and there’s plenty of space in all of the reception and bedrooms, yet they are all still very cosy and comfortable. There’s huge potential here because the accommodation is so flexible and can easily meet the needs of any family. There are gardens to three sides and include a lawned area which is ideal for al fresco dining during the summer months, a pretty courtyard garden, and a terrace. Mature borders create an excellent degree of privacy and the building has a secluded feel. There is also a driveway, and a gravelled parking area for a number of cars. “Our guests have described the property as ‘tranquil’,” said Ruth. “It’s a very peaceful house in a beautiful area with lots of wildlife and plenty of things to see and do on your doorstep. Commuting distances on the train to Newcastle and Edinburgh are excellent. The former teachers from Northern Ireland, both in their 60s, have decided to retire and are looking to downsize and stay in the area. “There’s a very good social life in the area too,” Ruth explained. “It’s a very friendly place to live and we’ve made a good network of friends here. The Old Vicarage, Church Road, in Tweedmouth, Berwick, is on the market for £600,000, through Smiths Gore, tel: 01289 333030.